Last year I posted a blog article which described the issue with SharePoint 2010 and having a footer. Well similarly SharePoint 2013 has some of the same obstacles when adding a footer. If you are interested in reading more detail into the issue w/ 2010 then go here: My SharePoint 2010 Sticky Footer Solution. If you just add a footer to your master page it will be displayed directly under the page content. On a page that has little content then the footer may show half way up the page. Alternatively if you try a pure CSS sticky footer solution it may not work correctly either because SharePoint uses the page height to calculate where the scroll bars will go (mainly due to the header / ribbon always being at the top). [Update 10/9/2013] – Added code from Robert, to handle MDS type pages. [Update 9/1/2013] – I noticed that these scripts do not work on Team Sites, this is due to the Minimal Download Strategy Feature that is enabled. Turn that off and this work perfectly fine. I’m still researching how to make the scripts how with that feature enabled. I’ve also updated the code to use it’s own function to detect height. Padding (top/bottom) can sometimes throw off the size computations. 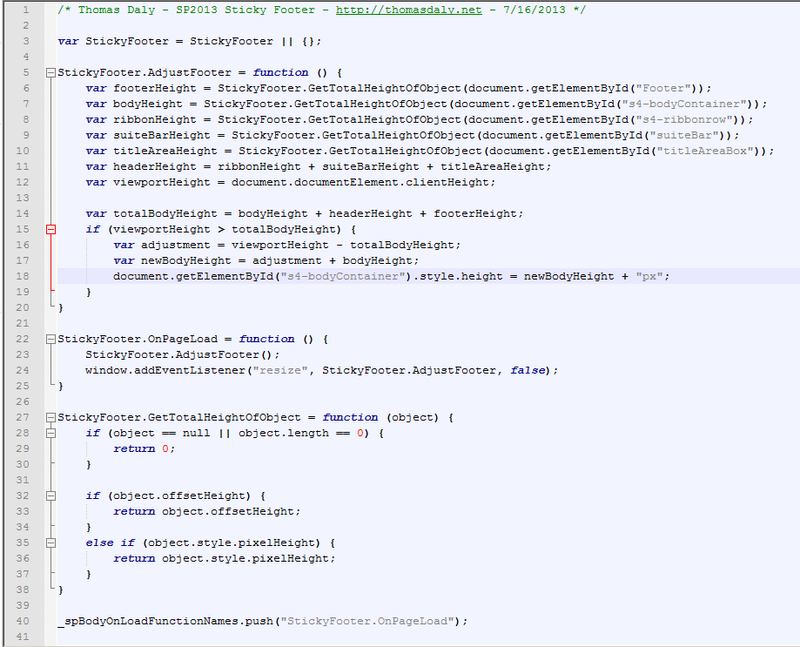 Simply add this div after s4-bodyContainer in the master page file. As you can see below an export of the DOM from the IE Dev Toolbar. I also bind to the window resize event so if the size of the screen changes the ribbon should stay on the bottom. The link to the JS file is dead. Could you either fix that or embed copy/pastable code in the post? Working on it… my company changed their public site and my files were on there. There are a lot of blogs about Custom SharePoint footer but not many that are so precise as this one…. sorry for my late response. feel free to blog away. I’d be interested in reading it. Impressive. However, your solution does not account for fullscreen display (F11) causing the function to apply additional spacing that can only be reset once the user refreshes the page. Also not sure if this is due to padding/margin issue you specified, but it appears the bottom border of an IE window retains its height area; causing a small white line to appear under the footer when maximizing the window. Thanks for checking out my solution. I’ll take a look at what your saying and see what I can do to handle that. absolutely, just adjust the css of the width on the footer and it should be good to go. Actually this is what I ended up doing. Adding an iframe webpart made the page leave the MDS mode. Thats great – Thanks for this! I will try this out. I’ve noticed that the footer sometimes won’t work on certain pages where partial page loads come into play. For example a datagrid page where the content takes time to come through. The footer will be in the middle. The asyncDeltaManager might fix that. Nice Article,and very interesting.Thanks for sharing this one.